I’m off on another adventure! Once again I’ll be trying to make art on the road…or in this case, on the fly. I’ve just arrived in Greece after an overnight flight. I’m sitting in the cafe’ enjoying a few minutes of free WiFi and a cappuccino. I’m again reminded of how great a cup of cappuccino can taste! Europeans have got the formula, or perhaps the right machines for great coffee. I’m feeling pretty rested despite light sleep on the plane. I’ve decided to not expect myself to create a lot of finished work while here. 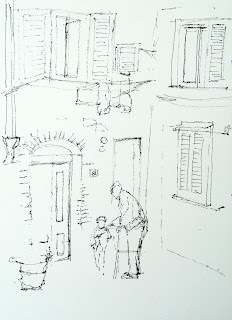 I am going to try to capture moments through sketches and quick studies. I hope loosening up will allow me to be more free and less inhibited. That pressure to do “great things” can be stifling, and I had a bit of that feeling on my last trip. Those of us with perfectionist instincts can fall prey to that kind of trap if we’re not careful. When I first began doing art, I wouldn’t start a painting until I knew where I was going to hang it! How silly that seems now, but I’m sure someone out there can relate. Thankfully, I’ve moved past that kind of mindset, but every once in a while I have to fight for the right to just jump in and do something simply for the fun of it. Those of us who come to art later in life have to sometimes be willing to set aside the sense of competence and accomplishment we have achieved in other realms of our life. There’s almost a need to surrender our egos to the process of exploring something new and very challenging. If we are going to learn new things as adults, we have to be willing to play around and perhaps fail occasionally. Ironically, I’ve found that some of my best work has resulted from just giving myself permission to play around and have fun. When I have joy in the process it tends to show up in the painting. As a result, I’m all about encouraging my students to HAVE FUN and paint what interests them. It’s a formula that has worked for me, and I’d predict it would work for you too. You may or may not know about my recent trip to Tuscany May 2013. While there, I painted and drew my way around Tuscany and Cinque Terre with an art group led by my friend and mentor, Karlyn Holman. I had lots of fun, sketching here and there, and painting when possible. I loved what I did, but didn’t have a lot of “finished” work upon coming home. Prior to leaving on this trip, I did some work on a few of those sketches and had fun bringing a few of them across the finish line. Here are a few of the watercolors and paintings which have resulted from my adventure in Tuscany. In the painting I call “Bubble Boys” I tried to capture a sense of light from the left and use it to shine a spotlight on the main characters of the drama I was trying to create. The scene was a quiet corner in Castellina. The young boy and the old man were in a separate location in the same town. I had been charmed by their interaction and took some photos of them. Later, I decided to merge them as characters into my scene after I’d drawn the location as I’d found it. The scene was originally without people. After assessing the drawing, it felt lifeless and so I placed the exchange between these two into the scene. The result is this painting. 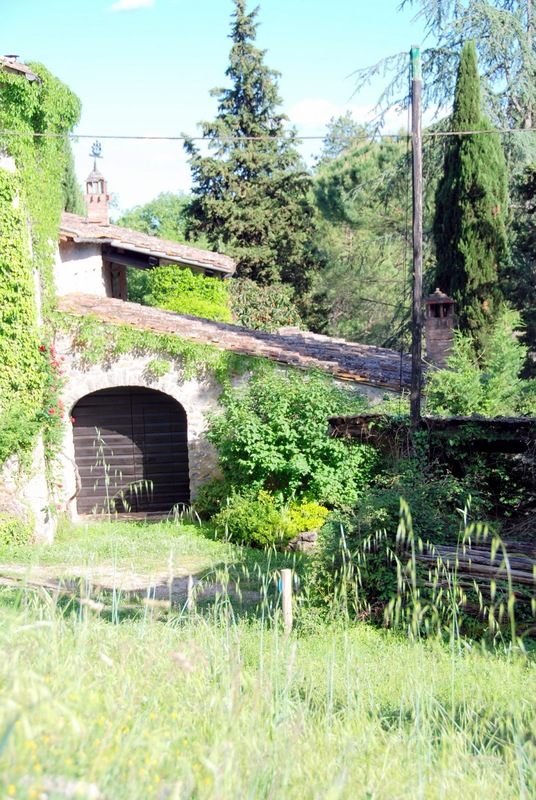 The villa pictured in this scene was very near San Fedele. By pure chance, I ended up perched atop a ruin of a celtic altar in order to capture the scene. The whole experience was magical…on a Tuscan hillside by myself and in the midst of all this greenery. This painting begs the question: when is the painting complete? Sometimes the answer is, “when I’ve said all I have to say on the subject”. I’m not sure if this one is complete…I still am tempted to inject an image of the fawn that visited me at the end of my time there, but for now, this painting is at least a remembrance of my magical moment at Villa Casa Nova. The rooftops of Siena were not altogether evident in walking around town, but after photographing my way through the city I found that some cropping and zooming allowed me to focus in on some of the abstract patterns found above the rooflines. There is a lot going on above the street level as you can see…wires, dishes, balconies, terraces, antennae, and more. It was fun to treat them as patterns and make that the focus of this painting. I was able to gain permission from the photographer to paint this aerial view of Porto Venere in Cinque Terre pictured below. 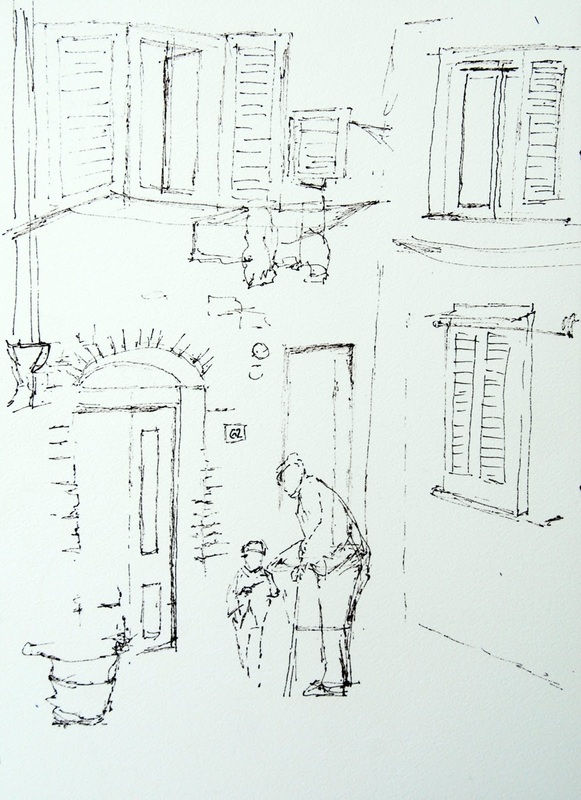 We met while on a ferry boat shuttling between the towns which form the Cinque Terre. She and her book of photographs were lovely. In painting it, I used a bit of collage to create a sense of the texture in the hills. What I was really going after was the sense of the dramatic setting for the church at the entrance to the harbor and the steep incline on these precipitous cliffs. I think the perspective of the composition helps get my point across. It’s incredible that people have lived their lives for so many centuries perched on the sides of these cliffs. I’m hoping this piece conveys some of my sense of wonder at the beauty and the ruggedness of the area. Our home base in Tuscany was the restored former monastery of San Fedele. Such a romantic place! That was the intention of this painting…to capture the romance of the location there. I decided to give the wrought iron fence some prominence and push the lighting to create a sense of warmth. I hope these paintings give you an idea of how wonderful it can be to augment your travels by capturing your memories through photography, drawing and painting. That’s why I’m on another art oriented trip…I can’t get enough! As for Tuscany, I can’t wait to go back! Showing San Fedele and the Chianti area to friends and students who may want to join me is next on my bucket list! Let me know if you’d like to be part of our adventure in Sept 2014!!! Cost is $2695 per person and includes art and cooking lessons, double occupancy room, two meals per day and all transportation from the airport and around the area to local sites I feel l will be conducive to painting, drawing, and photography. My Greek Adventure will continue for the next couple of weeks.